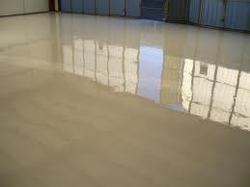 Owing to the presence of our expert team members, we have been able to provide Epoxy Floor Coating. We make use of best available technologies and as per the precise demands and requirements of clients. These services are provided at affordable prices. 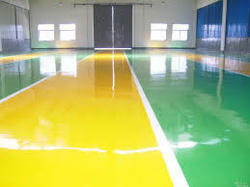 Our Epoxy Floor Coatings are well executed in time by our professional. For 500 gms mass at 25 deg C: 35-45 mins. Touch dry: 3.5 – 4.5 Hrs. Open to use: 24 Hrs. at low humidity of 60%. Full cure: Minimum 7 days. We have achieved great expertise in the sphere of manufacturing a wide range of Coats for Industrial & Structural Repair & Rehabilitation that are manufactured as per the anticorrosion protective coating systems, wataerproof coating and fluoropolymer coating designed by ISO12944 Corrosion Parameters. Epoxy Screed is a solvent free highly filled three parts flooring screed. When applied on concrete surface, it gives a high strength flooring & tank lining, capable to withstand extremely high loading, wear and chemical resistance. Quality Epoxy coating in lowest price . It can be applied on concrete, Rendering stone, Asbestos cement, Steel, Iron, Wood etc. to protect cantilevers, galleries, retaining walls, laundries, road tunnel walls, basements, workshops, balconies etc. against aggressive atmosphere. It also acts as an anti-corrosive coating on concrete and metal.